According to a Reuters poll, nearly 15 percent of the earth’s population believe that the world will end during their lifetime, while another 10 percent think the Mayan calendar proves that the world will end in 2012. The end of the Mayan calendar, which spans about 5,125 years, on December 21, 2012 prompted a whole field of pseudoscience about the apocalyptic end of the word, sometimes spurred on by some of the junk programs on the History Channel. What’s worse than all of this is that 22% of Americans believe in an impending Armageddon in their lifetime (the highest rate along with Turkey). This compares to obviously better science educations in France, where only 6% believe in this silliness, in Belgium, only 7% believe, and the United Kingdom, only 8%. The poll also indicated that individuals with lower education or household income levels, as well as those under 35 years old, were more likely to believe in an apocalyptic end of the world. Maybe the History Channel has a broader reach than originally thought. In case you were wondering, the pollster questioned 16,262 people in China, Turkey, Russia, Mexico, South Korea, Japan, the United States, Argentina, Hungary, Poland, Sweden, France, Spain, Belgium, Canada, Australia, Italy, South Africa, Great Britain, Indonesia, and Germany. 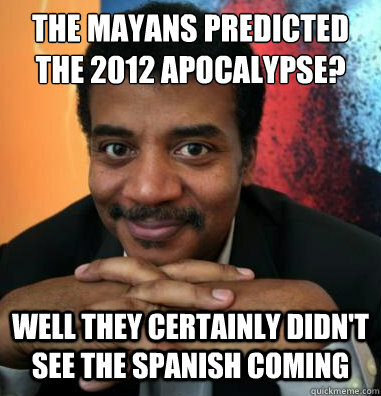 Nothing bad will happen to the Earth in 2012. Our planet has been getting along just fine for more than 4 billion years, and credible scientists worldwide know of no threat associated with 2012. This enormous planet is supposed to be coming toward Earth, but if it were, we would have seen it long ago. And if it were invisible somehow, we would have seen the [gravitational] effects of this planet on neighboring planets. Thousands of astronomers who scan the sky on a daily basis have not seen this. Typical of pseudoscience, it’s a moving target, so if one “hypothesis” is debunked, another pops up, like one of those Whac-a-mole games. Of course, the apocalyptic end of the world is not just the purview of the 2012 crowd, it’s also well-known part of Christian beliefs. In the comments section of the Reuters article, someone wrote that somehow Biblical myths were more credible than Mayan myths (of course, there’s no evidence that the Mayans themselves considered 2012 the end of the world). Of course, comparing myths for veracity is a bit ironic, and pseudoscientific. If the world does come to an end, it will be because of a completely scientific reason. A global warming apocalypse would be worrisome. A zombie apocalypse is another (although, more along the lines of a mass epidemic caused by anti-vaccination lunacy or a new infection). If it’s some meteor or comet, we’ll have some amount of warning. And bolide impacts that threaten all life on the planet are extremely rare, so the probability of one hitting in the next 50 years is small. So-called supervolcanoes could also bring an apocalypse, but there really are only a handful of those (with three in the USA). Interestingly, one of those volcanoes, Mt. Toba, has been hypothesized to be the cause of a population bottleneck in the human population about 70,000 years ago, reducing the number of humans to a few thousand. The probability of an eruption from one of these supervolcanoes in the next few decades is fairly small, and even then, it won’t destroy the planet. It’s doubtful that your creditors are going to accept an excuse of “pending apocalypse” to not pay your bills. In fact, given the total lack of science supporting any near-term end of world hypotheses, you can go ahead and plan ahead. Or if you want to believe in it, please sign over the titles to your Ferrari. via One in Seven People Think the World Will End in 2012 « The Skeptical Teacher.